What is the Direct Appeal? The Direct Appeal is the CPO’s main fundraising mechanism to support Enrichment Programs and Wish List requests. Direct Appeal requests are distributed at the beginning of the school year, and donations may be made at any time online, or by check payable to “Curtis Parent Organization”. Checks may be mailed to the CPO (at the Curtis School) or sent directly with students to be delivered to the Curtis main office. How do I purchase a Directory? The School directory may be pre-ordered through the Curtis Online Store, or at back to school night. The directory is generally published later in the fall and delivered directly to students in their homerooms. How does a new family subscribe to the Messenger? Please visit our Stay Informed page, for information on how to subscribe to our PTO Newsletter, the Curtis Messenger, as well as other important communication channels. What types of Cultural Enrichment does the PTO fund? The CPO attempts to fund 1-2 Cultural Enrichment events per year. These events are sometimes correlated with the Curtis One Book program, but may also include other grade-level or school-wide programs that are approved by the administration. What is the Curtis Wish List? Teachers and staff submit requests to the CPO for “wish list” items for their classrooms. These are generally one-time purchases, intended to support new initiatives or provide supplies or technology. The CPO Board reviews all wish list requests periodically and either purchases items directly or notifies teachers directly when their requests are approved for reimbursement. How can I buy Curtis Gear? Curtis Gear is available during limited windows of time through the Curtis Store. Families will be notified when the store is open and can go online to order gear, which is then delivered at a later date. Limited Gear items are also available at back to school night. March Madness is the CPO’s only major parent social and fundraising event. Does Curtis have sports teams? Schoology is the online platform used by Curtis teachers and staff to communicate with students regarding academic assignments, grades, clubs, sports, and the general life of the school. Students are assigned a Schoology account in 6th grade, which they keep until they complete the 8th grade. Parents are also assigned a Schoology account, where they can see their individual student’s posts, assignments, and grades. For more information about Schoology, as well as the 1:1 Chromebook initiative, please visit the SPS information page. What clubs are available for students, and how do students sign up? Curtis has many clubs and activities for student, including Theatre Troupe, Computer Club, Science Olympiad, The Cauldron, Curtis Angels, Robotics Club, Math Club, Forensics Club, Model UN, Student Council, Games Club, Yearbook and Chinese Club. Sign up information is given directly to students in September. What school supplies will my child need? Each team posts a welcome letter on the Curtis Middle School Website, containing a list of supplies required for each student. Additional lists are posted for World Language classes and Band/Orchestra/Chorus. What is after school Tues/Thurs extra help time? Most teachers offer “extra help” time on Tuesdays and Thursdays after school. Students and teachers use this time in many ways (completing homework, re-taking exams, clarifying material, extra challenge). Your student should reach out to his/her teacher directly to confirm the teacher’s schedule and coordinate usage of “extra help” time. Do I need to send in a note if my child has a doctor appointment? If your student will miss school time for appointments, you will need to contact the school and provide a note. Teams offer conferences in the fall and spring, but they do not occur automatically. If you would like to meet with your student’s team, you should reach out for a conference. Please contact Jean Pallone to schedule one. You may also contact teachers directly to discuss any concerns regarding your student. Is there SED in middle school? Yes there is! For more information, visit Sudbury Extended Day - Curtis. What time do they need to be dropped off in the AM? School begins at 7:45 AM. Where do I go for car pick-up? Drop off and pickup occur at the front entrance of the school. Administrators are generally present at both times to guide cars through the process. Does my child need a note if they are an occasional bike rider or walker, or can they decide that day, based on the weather? Unlike elementary school, notes are not required at Curtis for change of dismissal at the regular dismissal hour. What is an example schedule? Do students always have subjects at the same time of day? No. Students will rotate through a 6 day schedule. A student might have Math during block 2 on day 1, but during block 4 on day 2. 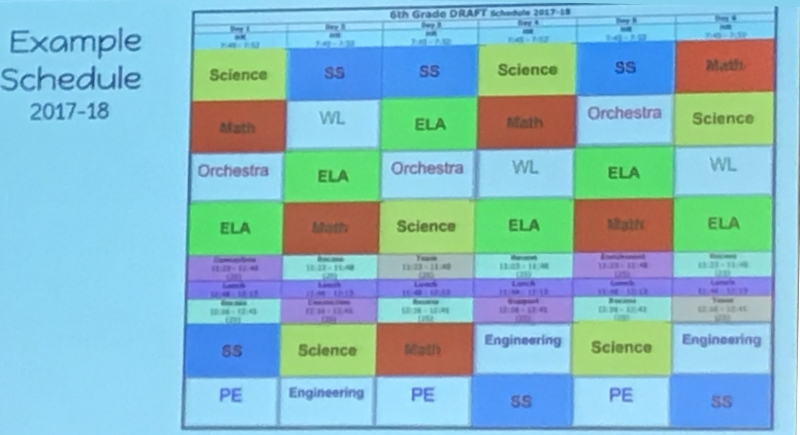 Every student’s schedule will be unique. What does it mean to be on a team? Your child is assigned to a team before the start of the year (teams are named after things in nature colored white or green such as Forest, Birch, Diamond or Snow). Your child will share core classes (English Language Arts, Math, Science and Social Studies) with students from their team. Other classes such as Unified Arts (UA) classes or world language will include a mix of students from the entire grade. What is a UA class? Unified Arts (UA) classes are those classes outside of the core such as Music (general), Art, Computer Science, Engineering, Physical Education and Health. Students have a 25 minute recess block before or after lunch every day. How is the school year organized? Similar to the elementary schools, the Curtis school year is divided into 3 trimesters. Core classes, language, band/orchestra/chorus meet all year, where some UAs alternate. Students receive report cards at the end of each trimester, and a final grade at the end of the school year. Report cards are not sent physically, but made available through the Aspen portal. Students will also have detailed information regarding their grades through the Schoology platform. School hours will be 7:45 a.m. - 2:25 p.m. Hours for early-release Wednesdays are 7:45 a.m. - 12:00 p.m. Students need to be seated in homeroom when the bell rings at 7:45. Students arriving between 7:15 and 7:35 will go to the cafeteria where they can sit and do homework, read, or chat with friends. They will be directed to homeroom with plenty of time to put belongings in lockers and prepare for homeroom. What is the CES Block? CES Block will meet 4 periods during each six-day rotation. CES includes Connections (2X), Enrichment (1X), and Support (1X). Connections will involve a social skills curriculum, which will create a systemic framework to promote students’ social, emotional, and academic learning. Enrichment will provide students with three trimester courses designed to excite, challenge, and encourage learning. Support will enable teachers to give students what they need in terms of direct instruction, intervention, and opportunities for independent work and growth. Do students still have Team Academic Assistance Block (TAAB)? Students will not have TAAB next year, however, every student will have Team Time twice in the six-day schedule. During this block, students will have an opportunity to get extra help, retake tests, complete work, or access special education services. Can my student take both chorus and band/orchestra? Students may take a combination of band or orchestra AND chorus. Will my 6th grader be in classes with 7th and 8th graders? No, students are only in classes with their own grade level. Does my student have classes with students on other teams? Yes, students will have Unified Arts and World Language classes with students from other teams in their grade. Will my student have lunch with students from other grade levels? No, students only have grade level lunches.